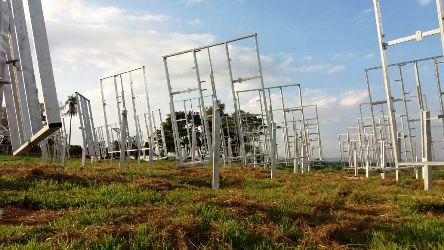 The University of São Paulo in Pirassununga (see photo) is about to get its own field of heliostats on campus. Once completed, the sea of mirrors will focus sunlight onto a receiver connected to an Organic Rankine Cycle system. The heat transfer fluid will be ambient air. The ORC turbine ‘waste’, hot water at 90 °C, will be directed to a nearby abattoir. The demonstration plant is part of SMILE, which is short for Solar-Hybrid Microturbine Systems for Cogeneration in Agro-Industrial Electricity and Heat Production. The aim of the Brazilian R&D project SMILE is to construct two industrial solar process heat systems, powered by solar energy and biofuel, that will generate both heat and electricity. In addition to the demonstration plant at the University of São Paulo, or USP for short, a second installation will be set up on a farm in Caiçara do Rio do Vento, in the northeastern state of Rio Grande do Norte. This second plant will produce steam directly in the receiver and channel it to a steam engine and a dairy. The USP plant’s thermal receiver will have 380 kW and the Caiçara one 350 kW of capacity. The former will have a biodiesel burner installed behind the receiver to even out temperature fluctuations due to varying solar irradiation and achieve a consistent inlet temperature at the ORC turbine. The latter will use waste wood to provide a stable flow of steam. SMILE has been co-financed by manufacturing businesses, the German Federal Ministry for the Environment, also known as BMU, and the Brazilian Development Bank, or BNDES for short. Project partners are the German Aerospace Centre, the University of Sao Paulo and Solinova, a USP spin-off which was founded in 2008 and specialises in renewable energies. “The heliostat field is one of the key cost factors of solar tower process heat systems. This is why our aim has been a high proportion of locally manufactured components,” said Johannes Hertel, Project Manager at the German Aerospace Centre. During the first stage in spring 2017, several local manufacturers built and delivered their prototypes of heliostat mounting systems. These prototypes were examined thoroughly, and improvements were made before USP commissioned the supplier Hydrocom, based in Paulínia, São Paulo, to deliver the structure for 73 heliostats of 9 m² each. The installation of the metal structures for the plant in Pirassununga has been finalised by the local company Alphatech, based in Limeira, São Paulo, in April 2018. The Caiçara field, which will consist of 50 heliostats, will be produced by Metalúrgica Aço Lar based in Mossoró, in the state of Rio Grande do Norte. The company had first manufactured a heliostat prototype which was tested on the farm. Guardian Glass, situated in Tatuí, in the state of São Paulo, will now deliver the mirrors, of which nine are required for one heliostat. They need to be bent in two axes to produce a sufficiently small focal point for the receiver. To make local manufacturing possible, the partners decided to use what they call a ‘rim drive design,’ which is a novel, and much simpler, method to move the heliostats of both demonstration plants. It combines a half-circle steel bar with cogs and a chain drive, which means that all components can be purchased in Brazil. The design is explained in the attached paper.